A reader writes: what, exactly, is a hook check? It’s a fair point. If you’ve roamed as far as page 87 in the hardcovered Puckstruck, you’ll have learned things about Frank Nighbor and Jack Walker and their hook-checking exploits that you never knew before without having been provided on the page with an actual definition of the lost, lamented art. “The passage about the hook check drove me crazy!” read the e-mail that came in from Kingston this week. Steven Heighton was perplexed. “I mean, what IS a hook check? You never say. I wanted to try it out in my game today . . .
Much as I like Borgesian — okay, I like Nabokovian, too — the truth is that the lack of a definition is one more oversight of mine. The hook-check file in my office is filled with hook-check facts and info; some of it just never got into the book. In Let’s Play Hockey (1957), Lynn Patrick and Leo Monahan suggest that players be versed in five important checks. In order, they’re the hook, the poke, the sweep, the stick lift, and the body. It consists of a defender going down on one knee, extending his stick flat on the ice and hooking the puck away from the carrier. When properly executed the hook check is a pretty play to watch and a hook-check artist will come up with the puck nearly every time. … Hellman suffered a serious flesh wound in the face during practice. In hook-checking [teammate and master hook-checker Frank] Nighbor, he lost his balance and fell on Nighbor’s skate, cutting open his cheek and injuring his nose. 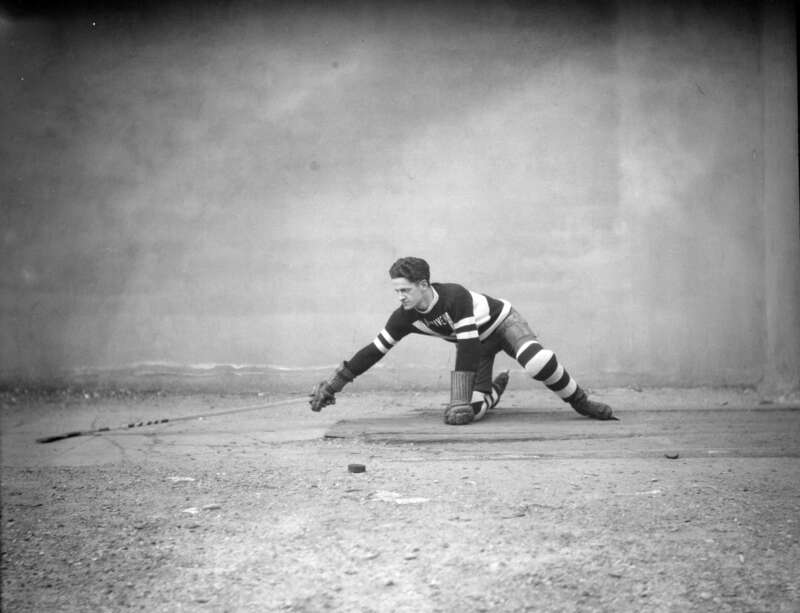 Hellman is in St. Paul’s Hospital here, and it will be impossible for him to play again this season. I remember being taught the sweep check at hockey practice in the early 70s but no hook check. By then it seems the sweep had come to embrace both maneuvers. Curiously, last weeken my 14 year old asked about the sweep. So the diagram is timely and appreciated.